Former animator from The Simpsons, Dante Fabiero, created Slothilda, a mascot for those who feel sometimes like leaving the the warmth and comfort of their doona is a bit too much. He posts comics and gifs about this lazy little beastie on his website, where he also sells stickers and other merchandise, including this book. 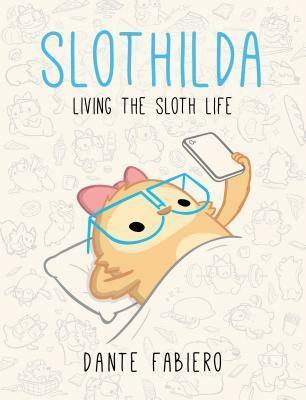 Slothilda battles daily with technology addiction, junk food and consumerism, all the while looking fuzzy and adorable. From Slothilda by Dante Fabiero. Slothilda is cute, funny and relatable. I would say it would make a good gift, but that might come across as a passive-aggressive dig unless you know the recipient's sense of humour really well. If you want to buy it for yourself it will probably at least make you smile, if not chuckle. Disclaimer: I was given a complimentary copy of this book by Skyhorse Publishing, via NetGalley, in exchange for an honest review. This is me! I want one!